Health is Wealth and staying healthy is not that difficult . It needs little management & dedication . Well planned healthy meals , little of exercise and most important a positive mind set . Dieting should not means starvation as it leads to other problems like lack of essential nutrients in body and feeling low but it should be a healthy diet with healthy drinks . A well planned diet includes healthy foods & healthy drinks . We have done lots of research on healthy diets & diet plans , Now let’s discuss and explore on healthy drinks . With the term healthy drink the first thing that comes to mind is Fruit Juices . Fresh fruit juices are too good for health , the one prepared at home . But sadly many people do not have time to prepare that at home . Most of them are loaded with sugar and preservatives , which is bad for health . So in place of doing good they could harm the body . Better to avoid such drinks . So the next option that comes is Infused Fruit Drinks , which are gaining popularity these days because of their health benefits . Now What is a Infused Fruit Drink ? It is a type of Detox drink which helps to eliminate toxins from body . How can it be Prepared ? One need to add washed fruits , vegetables , herbs to water and let it get infused for few hours so that it’s ready to drink . But for that one needs a good quality infuser . Today I will share about a brand which has some superb products which can be used to prepare such Infused drinks and is easily available online in India . I am talking about Instacuppa . A brand which has some excellent products to make healthy drinks . All Instacuppa products are 100% BPA Free , Lightweight , Durable . They try to minimize the use of plastic and go for glass or bamboo which are healthy alternatives . 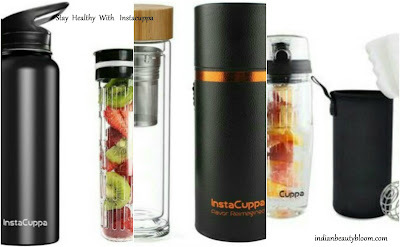 One can prepare variety of healthy recipes and drinks using Instacuppa products . One can easily make fruit infused drink using this Fruit Infuser . 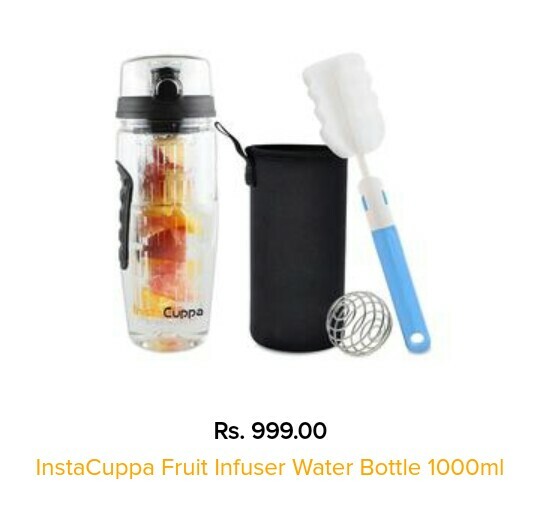 One needs to take out the infuser rod and fill it with fruits & herbs like mint etc then close the lid and put it back in the bottle , fill the main jar with water and let it get infused for some hours and then enjoy the healthy drink . Available at an affordable price of Rs 999 after discount . One can check the product here . 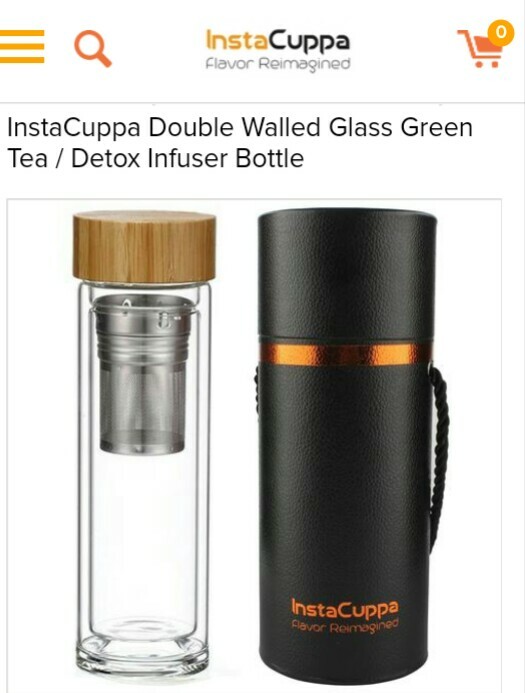 This double walled green tea infuser bottle will help to keep drink hot for a long period of time . And we all are aware of numerous health benefits of green tea . Which could help us to stay hydrated and benefit from antioxidants present in green tea . 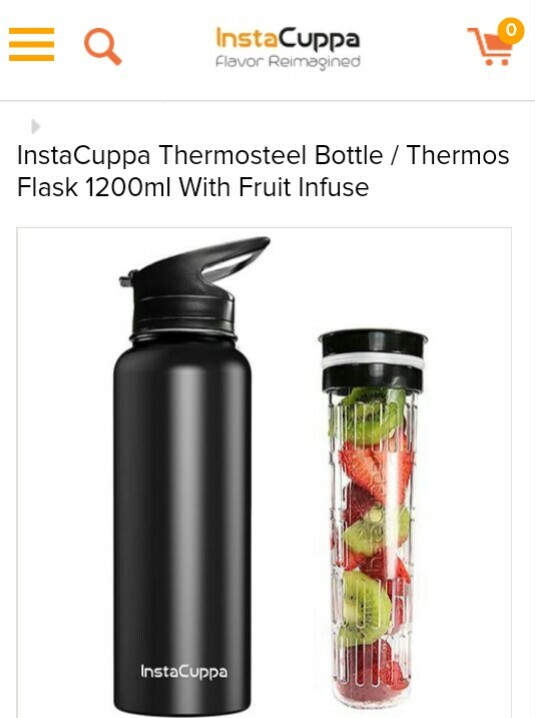 This one is Fruit Infuser with a Thermos Flask . This is a unique product which will infuse and and insulate fruit water and keep it cold upto 24 hours . So with these products one can easily make infused drinks or detox drinks and enjoy healthy drinks without worrying much about calories . * Made from premium grade Tritan . * Use of natural product like bamboo , Glass . * Easy to clean & Maintain , Even Dishwasher safe . * Can keep beverage hot upto 12 hours and cold upto 24 hours . One can check video’s on their site to know how to prepare Detox Drinks , Fruit Infused Drinks etc . and should not repurposed , republished or used otherwise . The content herein is owned by the blogger , Super blogger Challenge 2018 is not responsible for any sort of infringement caused .